This time last month, as I cobbled together news from thousands of miles and a couple of oceans away, I was elated. Mahinda Rajapakse, the man who ‘won the Civil War’ with brute force, built a seemingly unstoppable political dynasty, eliminated presidential term limits to stay in power, was losing. 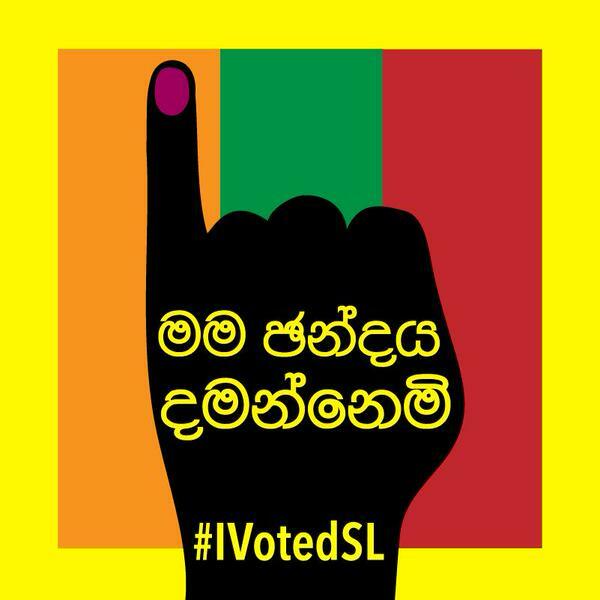 I imagined that Rajapakse’s clan would rule Sri Lanka for the majority of my lifetime; instead, he was being slowly ousted from office by Maithripala Sirisena, once considered both a cabinet member and a trusted ally, one slow vote at a time. Halfway around the world, I held my breath with Sri Lanka, felt the collective tension wrap tendrils around my shoulders as we waited for something–gunshots, screams, tears–the sounds of a country breaking. I texted my parents. Are you watching? Is this real? They reflected back my own fragile hope, struggling to breathe beneath overwhelming cynicism. It’s not over. He’s not going to give up. Just wait. And wait we did. We waited with bated breath as the hours became days, weeks, and now a month. We waited as rumors flew that Rajapakse had ordered a coup, and that the army had refused to comply. We waited and watched in sheer disbelief as he left Temple Trees, as people piled into the street to watch Sirisena be sworn in. It’s now been one month since the Sri Lankan presidential elections, and I’m finally attempting to explain what this means to me, a 2nd generation American a continent or two away. My relationship to Sri Lanka has always been fraught with the trials and tribulations of a diaspora kid, and a queer one to boot. For most of my childhood, Sri Lanka was a memoryscape–a place where stories, lives, people existed in a living contradiction of the present and the past. As an adult, I’ve made an effort to reconnect, and yet: the longest time I’ve spent on the island is four months; the longest I can imagine living there is a few years. I struggle to speak broken Sinhala, and am generally disconnected from the day to day goings on in Colombo. If you think that it couldn’t be just as personal for you as it has been for me, I believe it just means you haven’t thought about it for long enough – if you feel you weren’t personally, directly affected by the Rajapaksas, then I ask you to just look around yourself. Someone you know, perhaps even someone you love, was. They took something from each one of us: freedom, money, courage. We came up against dead-ends trying to build normal, every-day lives. They took our vitality, our identity. They took away our right – and our urge – to think, to speak, to resist, to demand better. For me, Sri Lanka under the Rajapakses was a lie – not a country. Even worlds away, in the frigid temperatures of Madison, WI, this election felt personal. I couldn’t find the words to explain that I could feel the world breaking. I didn’t know how to translate that the lump in my throat, illegible in American English, meant that I’d waited unknowingly for this moment for years. It’s taken me years to understand just where Colombo lives in me. My parents left a country so that we wouldn’t grow up in fear, and by and large, their sacrifice succeeded. And yet, fear and trauma find ways to be passed down. I’ve heard the stories of white van assassinations; of bodies floating back from the ocean; of people suddenly lost and never found. When I left for Sri Lanka in 2010, I remember my dad pulling me aside. He warned me that being politically outspoken in the U.S. was one thing, but that speaking out in Sri Lanka was still dangerous. He warned me that the walls have ears: you never know who is listening, and retaliation is a constant threat. Though I would be in an American program, my brown skin, my brown name, my brown history rendered me unsafe. I’ve watched Tamils in Sri Lanka continuously treated as less than human, and wondered when the next civil war would begin. Sri Lankans invented suicide bombing, and it worked. The civil war entered the otherwise privileged space of the capital. Though without nearly the level of intensity as the north and east, the whole country became a viable battleground. I’ve waited for that phone call–the bank was bombed again, the phone lines are down, we can’t find so-and-so. This is what it means to come from the diaspora of war, even from the privileged Sinhalese side. On the other hand, this is a moment of deep pride. It’s been an exceptionally hard few months in the U.S. As I join students, friends, and fam out in the streets to demand that #BlackLivesMatter, I’ve felt the cynicism in American democracy, often held at bay by my privilege, take hold like never before. I’ve never felt less American, more convinced that we live in a country that wants our labor and our culture, our music and our art, our bodies and our heartbreak–but not our lives. In a twist of irony, I’m looking to Sri Lanka for hope. This election is a compilation of small acts of unbelievable courage. Courage to cast a vote, knowing that violent repression or retaliation is at stake. Courage to refuse military orders for a coup, despite the ex-President’s brother being the Secretary of Defense. Courage to run against an incumbent with a violent history, knowing that losing an election could cost your freedom or your life. As America runs herself into the ground, I’m looking South for hope. There’s a long road ahead, and only time will tell if Maithripala Sirisena can be the leader that Sri Lanka needs, if he will actually have the courage to address the rightful grievances of Tamil people before, during, and after the war. But for now, I’m claiming this victory as my own, at least in small part. And I’m taking pride in a place too often seen as backwards, primitive, and undemocratic. I’m going to let my heart swell as I imagine the power of individual acts of incredible courage to reclaim not just an election, but a country.